Angels of Death is a video game, a manga, and, as of July 6, an anime. It is clearly an intellectual property on the rise. Judged solely as a game, it's a decent horror adventure with excellent writing and a few interesting gameplay scenarios that would benefit from less play time spent scrolling through dialogue and more time solving brainteasers. Angels of Death follows Rachel Gardner, a 13-year-old girl who wakes up on the lowest floor of an unknown building. As she searches for an exit, she runs afoul of a crazed murderer wielding a scythe. In order to escape from the basement and the floors above (each with its own serial killer), she will need to solve puzzles and outsmart her adversaries. While Angels of Death features some tried-and-true horror tropes — chief among them a young person trapped in a mysterious building, watched by video cameras — the game goes in some refreshingly weird and dark directions, inserting plenty of plot twists and revelations along the way. It's a title that earns its frights through dread and disturbing material, not via cheap jump scares and gratuitous gore. It's also surprisingly complex in its treatment of characters — where serial killers and sadists are framed almost sympathetically. Overall, storytelling and character writing are definitely highlights; it's easy to see how the property translated into a manga and an anime. While storytelling rules Angels of Death, engaging gameplay is at something of a premium. As Rachel moves upward through the unknown building, she will meet many twisted individuals and witness several horrific acts, but she will not interact with the game world as meaningfully as possible. Now, this isn't a "walking simulator" or a visual novel — far from it — but it needs urgently a few more challenging, elaborate puzzle set pieces. What the game lacks in breadth and depth of puzzles it somewhat makes up for in variety. Each of the game's four 90-minute episodes supplies a collection of unique puzzles and mini-games. You'll outrun killers, shoot apparitions in a first-person perspective, dodge deadly darts, leap onto platforms above a spiked floor, navigate through a darkened maze, and escape from a room filling slowly with poison gas. This last challenge, which takes place in episode two, is by far the best in the game. Rachel and her partner will explore a locked room, solve a series of difficult puzzles, and share a single gas mask, as a timer counts down to their deaths. If all of Angels of Death played like this segment, it would be one of the better Switch games of 2018. Built in RPG Maker, Angels of Death isn't going to win any awards for graphical fidelity. Yet developer Makoto Sanada has turned in some detailed and diverse settings, regardless of the limitations of the game development tool. A sinister storyline, a creepy location, and a healthy imagination can make a few pixelated blood stains seem truly scary, after all. That said, the do-it-yourself 2D graphic visual style might prove ineffective for horror fans looking for deeper immersion. Fans should register no complaints with the game's soundtrack, however. Filled with driving synth music, soft rock arrangements, techno tunes, and somber lullabies, it's a varied and interesting score that's worth appreciating on its own. 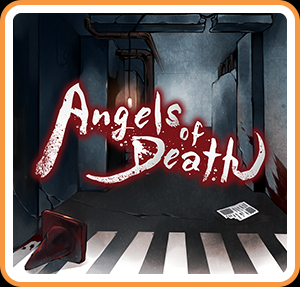 Angels of Death is a fine game, with a surprising, nuanced story, lots of gameplay variety, and an excellent soundtrack. The game's puzzles and physical challenges are a bit shallow and easy or, for long stretches, non-existent, but are held together tenuously by its artistic merits. This review is based on a digital copy of Angels of Death for the NS, provided by the publisher.